A compact version (critical parts) of the thread is here below. The partially sidetracked complete 16 page thread on Seasteading org is here. 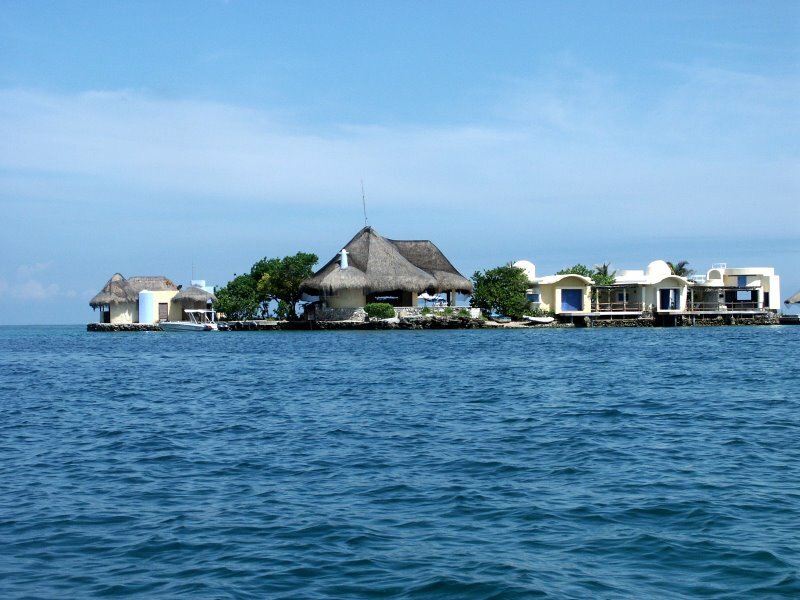 This thread is a follow up thread of the Seasteading Outpost Belize Thread. Several locations for an Outpost has been suggested. The downside is that those locations have been defined per "internet search". One of the general rules we should keep in mind is that if a property is in internet already - it is already in hands of a realtor - means not really a good option. So what we would need first is local scouting - means persons that really live in the area, have capacity to compare, have a boat to get around, can negociate with locals without paying a gringo fee on land purchase. 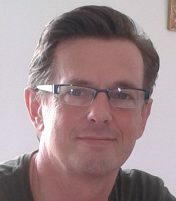 This thread is dedicated to a practical approach for buying land in the caribbean region for seasteading purpose. I live in Colombia since 16 years, and i have built a wooden house with classical palm roof 18x9m foundation - 2 floors on stilts over concrete blocks at a in that time (1998) not developed beach in a mangrove/beach area in the San Bernardo Archipelago near Cartagena as there was only sand and water there i called it "ARENAQUA". It started literally one day with comming in with a boat with a truckload of wood, a few sacks of cement, basic tools, hire local workforce...so many of the experiences are directly applyable to a seasteading outpost as suggested in the Seasteading Outpost Belize Thread. What concerns aquaculture and fishing potential in the caribbean i would like to have a closer look at Rafael Viera who built a spot where he runs a breeding program for Mero Guasa - but i suggest to split this theme into a "Aquaculture potential in the Caribbean" Thread. What concerns your question if we could use the area of Arenaqua for an outpost this question unfortunatly has no simple yes or no as an answer - it depends on the project parameters. One of the drawbacks is that i do not own the place anymore, and since the situation has calmed down a lot in colombia those beaches have been in a rapid tourism development. Additional beach houses have grown around. Also the house is just 2 wooden platforms and a palm roof, with no walls at all. You can hang hamacs and sleep in the caribbean breeze but there is no infrastructure to support 30 people. Nevertheless i know the zone very well and consider it a possible zone for building a platform. You can get workers from Rincon which is about 5 km up the beach - so they can show up on the building site in the morning without you caring for trasport. You can get basic but limited supply in Rincon - you also have access to shipyards and heavy industry which is located 2 hours up the coast in boat in the bay of cartagena. The zone is on the "border of jurisdiction" for the harbor captain in cartagena, and for the harbor captain in covenas. Hotel Decameron has a Island hotel on the island just in front. The whole zone is hurrican free, wave protected due to the san bernardo and rosario islands. If we decide on parameter hurricane we have basicly 3 options. 1) build a steastead outside the hurricane zones this would limit the possible sites to the Colombian coast between La Guajira and Panama. Extremly touristic zones are bad due to high level of de facto regulation. Extreme remote zones are bad due to difficulty in galley and material supply. Access by land is a can have, access by boat is a must have. Building at the beach is forbidden everywhere in the caribbean - land 50 m behind the waterline is useless as a 50 m move for a fully grown seastead over land is impossible. This leaves a floating building site more or less as only realistic option. Floating also resolves the jejenes problem and a big part of the third party interference problem. So the site must give some wave protection, friendly locals, good business alliances, not necessary a formal land title. A long term waterspace rent agreement with somebody who has a property that has absolutly no interrest in the waterspace would be great. What comes to mind is renting the waterspace in front of a extended cattle ranch. A remote ranch will be happy to leave the waterspace in front of the property to a seastead just for getting the benefit to have a fast boat in reach that can perform a medical evac of the ranch workers in case of an accident. Ranches think in ton of cattle and hectar of grassland, beach and waterspace are of cero value for them. What is in favor in Colombia is that the land that connects to the caribbean is bad land (arid, salt marsh, desert, red soil) so the ranches ouside the coastal urban centers (Santa Marta, Cartagena) are enourmous to hold a few head of cattle and are little productive. So a agreed long term anchor right in front of a ranch that includes some 15 kilometer beach (average) can be purchased for very little money. Typical cost imagine colombia - arid, bad land. Yes goats are a good option (good market higher priced than cattle) also buffalo and rude indo - brasil cattle races brahman, cebu, - but would we not be better off just to "long term rent" the "floating rights" and leave the "ranch business" to someone else. In practice what you have in colombia is a big ranch, handled by 4 cowboys who herd about 3000 head of cattle living in a small hut somewhere on the terrain with a dusty access road . The owner lives in Bogota, Medellin, or Cartagena and visits the ranch at best 2 times a year for a day or two to supervise the round up and transport of major cattle transports. So what you have on "conflict potential with the land owner" is more or less that you see a lonley cowboy in transit counting the head of cattle about twice a week from the beach - he will be glad to be invited for a cool beer to the seastead anchored just 100m offshore and sending over a boat. It will be the only human contact he gets (beside the 3 colleages in the farm house) in a month. You may not see the landowner even once in 10 years (he is busy counting his cattle when he shows up - no time for visits) - at most you might have radio contact between the seastead and the farm house in case of medical emergency. Everybody will be happy having a seastead there because it offers additional eyes to safeguard the cattle and avoid that somebody comes at night with a barge rounds up a couple of dozend heads and takes them away by maritime access. 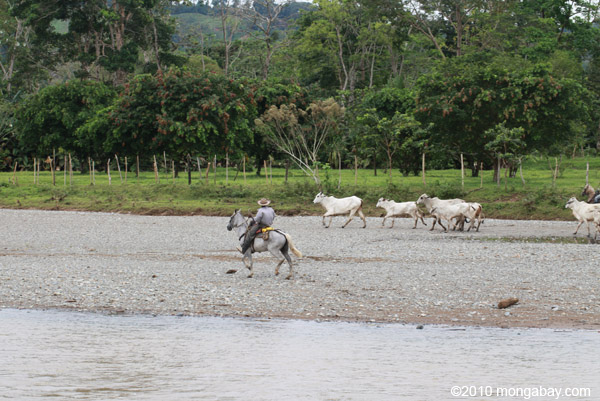 Cattle thiefs are a great concern for colombian ranchers. A ranch and a seastead are ideal complementary partners - the cattle land is worthless for the seastead and the beach and waterfront is worthless for the ranch owner. This is a very different situation about beachfront property than it exists in touristic centers or industrial zones where every meter of beachfront is a high price, high competition real estate asset. The beachfront situation changes radical about one hour in car (or boat) outside the major population centers. Instead of going for outside EEZ we should go for outside real estat agent interest - and target a "caribbean ranchfront seastead" as the most viable set up. This does not work in areas where there are no big ranches - like small islands littered with tourists - lets say - most caribbean island nations. It only works in big countries like Colombia where the population is VERY sparse and only concentrated in a few cities and most of the terrain is just empty and used for low concentration cattle ranches. So the first thing you will look for, when scouting for a caribbean seastead location is a "ranch ambient" free of realtor interest. This is where you can build a HUGE seastead just on the beachfront with cero third party interference to expect. So one of the first tasks when searching for a suitable outpost site would be to identify correctly ranch/beach situations on the map country by country all over the caribbean and diferentiate them from tourisms zones, real estate development zones, shipyard development zones, urban development zones and natural reseves which are all much less suitable for a beachfront waterspace seasteading venture. Done this correctly you may start to send scouts in the most promising countries and zones to create lists of land owners contact numbers to approach. Make sure that the scout is in company of a local - prefered a "primo" of the mayor of the nearest coastal settlement. - his family is "de facto handling" the zone - not the "authorities". Then work the contacts digg up "special opportunities" like the ranch that has a lot of grass but little cattle (owner is not liquid to buy cattle), or the old ranchman with the wife who prefers to live in the city and the children living and working in spain. For historica reasons (Colombia is the heir of the spanish overseas empire) Colombia owns most of the Caribbean watersurface. The blue area in the chart above is Colombian territorial waters. This fact and the status as emerging economic latin tiger nation, member of the CIVETS group, makes Colombia and especially the City of Cartagena with its hurricane free deepwater bay one of the "first places to look after" when talking about Seasteading and Baystead locations. I don't know Belize sufficiently to know where the ranch/beachfront zones are ubicated. Anybody here who has a deeper insight on Belize and can mark up the "promising zones". This part of Belize looks like a "high interference zone" zones that look "natural" can be protected parks, infested with jejenes - you need to go there scout, ask the locals to create a "info base" that allows you come to a informed decision. This can not be done by map and satelite, the neighborhood circumstances are the most important part of the business setup. This thread is a sub-thread of the Seasteading Outpost Belize thread, so i assume that we have to picture the project we are talking about as something like a floating community with a similar appearence as ephemereisle or a asian floating market. This brings up friction potential in industrial zones because it will be definitly "out of usual" for the zone. On the other hand a single family seastead working as drydock, or as ship repair barge, or as chandlery barge could be excellent suited for the industrial zone. You also might target both fields a bit by locating in an area where a industrial zone fades out into a ranch zone. So the seastead might have mobile units (catamaran barges) that head for the industrial zone in the morning for business while living and community aspects are placed outside the industrial zones. A major draw back to the near industrial zone community concept is, that in practice the zone just outside the industrial zone is normally a "poor people wild settlement" zone with high crime rate - so not necessary a spot to put a "gringo community" that will convert into a target. A solution would be to put the seastead not just off the beach as you would do in ranch ambient but move it out to open water a kilometer or so for protection purpose in this case the basic thought of SOBLZ - start on land and float out gradually will not work very well. I have mentioned on other threads that in general if you do a float out project in the size of 20m diameter "third party interference" is a dominating project factor as well in project risk as in project cost. It is therefore important that you make a preliminary analysis of what kind of potential third party interference factors and players do exist in a project location. I would recommend a biotop where the population density of potential interferers is low instead of a biotop where interferer occurance is high. In a ranch zone the population of potential interferers is very low - the ranch owner and the maritime authority can interfer in theory but it is obvious that non of them has neither an interest nor a reason nor a practical means to interfer much. In a industrial zone you are under the eyes of a lot of people that can (and very likley will) interfer . You have additional players like industrial neighbours that want to bring down your business, shipping lane interests, settlement plans, port authority, human rights, ambientalist groups, liquor authority, customes, mayor, etc... - the simple fact that you develop a activity in a "competed space" with many interests puts you in the center of all kind of fights, friction, and interference processes you have to take care of. If we talk a scale of 1 to 10 in "interference freedom zones" being New York City Harbor with all its regulations a 1 and floating outside the economic exclusion zone of any state offshore on open ocean a 10. On this scale a colombian ranchfront seastead would enjoy a high 9.5 of freedom to do whatever you want. while a colombian industrial zone seastead would enjoy a 7 - if situated in the middle of the bay of cartagena (1kilometer off shore) but only a 3 if situated near the shore of the same bay in the competed zone of manga. At the end how much interference potential you have to deal with depends on your business plan. i am not directly scouting locations as i do not have a project for which to scout and no budget frame in which to look - so it would not really make sense to scout as it would not be clear for what kind of development you are scouting at the end - and what conditions you need and can offer to a partner. The whole idea that the Authorities can, will, are called to, OBJECT something that is outside their strict and most narrow definition of their function is kind of "strange" almost everywhere in the world except where overregulation and nanny state is implemented in its highest bloom. In a country like Colombia, Venezuela, Nicaragua, Mexico , Brasil, wild settlements grow in remote areas every day based on fishermen outpost, cattle outposts, gold digging and mining outposts, etc.. People come in with tents - later put roofs and walls on the tents and stay - some day the thing has a name and is a "village" this is a ongoing process there must be thousands in development in south america right now. The setllement RINCON where Arenaqua is was no place on the map just a few years ago. So the idea of a bunch of people settling in a ranch area is nothing anybody (except the land owner) would interfer with or care about. Being on a seastead anchored a couple of meters offshore you would not infringe any existing law. one is handling ships and asociated business like harbor, access channels, captain licences, etc... - it is obvious that this part would not have any interest in something that is obviously not a ship and develops far from harbor activity. The other is litorales - which regulates the beachzone (30m sand from the waterline). They regulate shipyards (who long term rent the beach from them) . 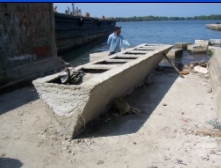 The building of breakwaters and other structures that change beach and marine currents. They do not care about anything that floats and does not even touch the beach. A seastead neither being a ship nor a building changing the beach - would situate exactly outside the jurisdiction of both branches. This legal vaccuum would get you interference free trough the first 10 years at least - after 5 years you have a constitutional "home right" - if you are the only development focus in the zone nobody will have a chance nor a interest to interfer with you. The right of not being driven out of your home, the right to work , is the strongest protected in most countries once you live there, work, and prosper in that zone the stead would be untouchable similar to any other city - no matter if it floats or sits on dry land what is protected is not the real estate but the rights of its inhabitants. Especially in a country like colombia where armed conflicts and driving out people from small rural settlements and interest zones has a history - that kind of rights is extremly protected now. what i am proposing is just a method to find a spot where a activity like creating a seasteading outpost as suggested by Pastor Jason in the Seasteading Outpost Belize thread could be developed sucessfully. I am proposing a method to find the spot - not a specific spot, not a property not a country. I try to explain how things work in Colombia where i live and which is the country that for historic reasons owns most of the caribbean sea and coastline out of the hurricane zone. I propose that we asign seasteading viability zones on a scale 1-10 being 1 a zone where you can do nothing on the waterfront without getting entangled with several interference factors and 10 a freedom zone where you have a de facto freedom compareable to EEZ but just off shore. I agree that buying land and get involed in ranch business might be a too indirect approach - so i would suggest just to seek a symbiotic relation renting floating rights on a ranch seafront for the more fragile building phase until the stead is sturdy enough to float out to the more open water. But the question if we stay in part land based like VENICE and ceate a seastead building facility to float out single family steads is also on the table - a geographic point like a seasteading mekka where all seasteading oriented activity is concentrated has its merit and could be "half land based" to enable the transition. My experience is that if you build something in colombia in a 2 worker / some basic tools - a shadow roof - set up - that cranks out 1 ton of construction per day - a budget frame of 166 USD/day (5000/month) is kind of a minimum set up. 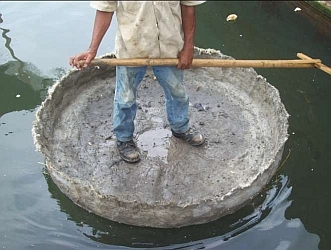 Imagine a start up like the imagine below - a couple of sparse connected floating concrete elements with people on it engaged in construcction of more floating elements aquaculture and similar activities. In a hurricane free bay in the caribbean in a 9.5 freedom zone on a > than 5000/month budget. I built a beachhouse in the san bernardo area some 10 years ago - i bought a official title for 30m beach aquired from a native for 6 mio Cop ( 3,133 USD) - i built on stilts not taking down a single mangrove bush. This was accepted as good practice. I also must say that there are areas in Baru where there exist 5 owners for the same piece of beach, (all having a 300 year old land title) and the colombian government has started to charge rent for existing houses with fixed foundations as they occupy public territory (the beach is public according modern colombian law) - although they may have (half valid - older ) land titles. So secure any real estate on the beach is kind of relative as the legislation is just not clear. I think this is so in most of the caribbean i know so having land on the beach can just be a impossible to achieve - except you buy a complete island like Richard Branson. Renting floating rights in front of the beach might be the nearest you can get to have beach property that is not in legal cuestion. I think it may have been a better investment to rent the floating right in front of the 30m beach and keep the native in charge of the land - he has a "natural birth right" to be there - he would have loved to rent the floating right for 100 years for less than 1000 USD. Around cartagena the "seasteading hot zone" where the poverty belts of the city start to thin out and real estate agents start to loose interest in driving land prices up starts about 1 hour in boat from the city center. mangrove / coral ambients have no road access - if they do it is the exception and there is always a major city built around the sea shore access point - and a cramped and competed city is not a good seasteading outpost location. I would see it as a more realistic setup to plan for a access road free ambient, in a tropical coastal zone. It matters little if the terrain is an island or part of the mainland coral mangrove ambients are ambients where the sea and the land have a mix up that goes over many miles and where roads and normal buildings can not be implemented. this was 300 years ago in times of the spanish treasure fleet - and it has not changed that much what concerns shore access since. To get a good image how buildings settlements and structures in mangrove / coral ambients look like and how they can be accessed by boat check here. To find a couple of videos about installations in coral/mangrove ambient in the san bernardo islands the rosario islands. 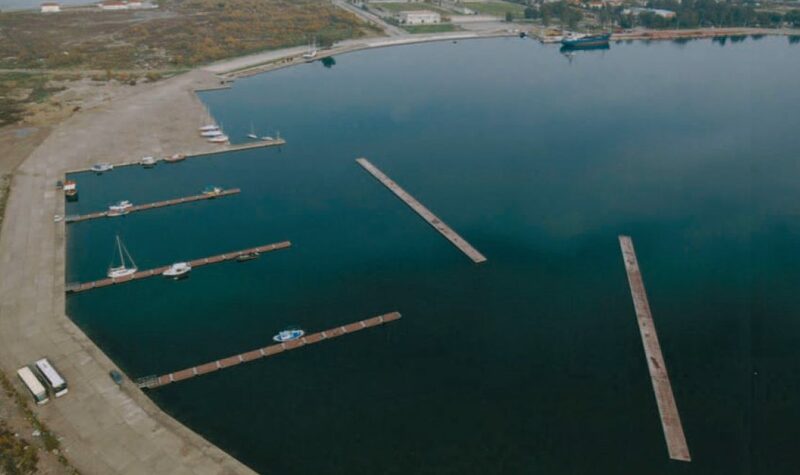 They are already a kind of breakwater marina installation although they work on base of stilts and landfill instead of buoyant platforms. the dry land zone between the 2 access roads who end in Rincon and Berugas is kind of ruled out - i would see chances for a seastead north of rincon or even in front of rincon as the mayor of this village is eager to bring tourism and development in. The village is basicly his "extended family". Another option would be a cooperation with Hotel Decamaron who runs a island resort on the island in front - a cooperation with the island that is marked as "el islote" - the whole reef zone is protected calm water. Guardarrayo, Tigua , Comisario, and the surroundings... up the coastline to the tip of the island of baru. They are really close to seasteading already... and they have birth and fishing rights to the lagoon of the san bernardo archipelago. They would be easy to convince that expanding islote by floating concrete honeycomb structures is a great idea. Watch the much bigger island in the background and the mainland coast being as good as uninhabitated. Ok. lets do it in Rincon - you can float hurricane free, the waves allow a modular building approach, you get workers (some 50 maximum) you can bring in material in trucks by land (sometimes when road is good) and in boat by sea (always), you have a enthusiastic mayor, you will enjoy a estimated interference freedom factor of 8-9 on the 1-10 scale. People comming in new can fly to cartagena take a bus or a boat to rincon (2 hours) - there are basic but economic overnight accomodation you can work with. In Balsillas just outside of rincon there is a tourism development with beach houses - so there is a general understanding how investment and development benefits a village - you got a excellent local investment and safety climate based on the understanding of the natives that they will go nowhere in generations if development does not come in in form of projects - rincon as epicenter of seasteading development they would like it. I can travel to rincon and grab the Mayor have a village councel tomorrow to make them sign our floating rights in exchange of bringing in a new source for jobs where there is non (exept Balsillas which is seasonal and creates a few watchmen and housekeeper jobs). The big mayority of the village knows the ocean and lives of fishing - the zone is overfished so current incomes are bad. The golden question is : what budget frame do i have to pull it off? - until now i had cero budget for "seasteading rincon project" - if i would have had budget frames i would have done it already years ago...so how do we change this situation? we are having a nice chat about how a startup in the caribbean could look like, how you would tackle the matter - how you would scout the place - what are the desireable zones from a economic and interfernce freedom point of view. Rincon and the san bernardo archipelago came up as a example because it is a zone that i scouted a decade ago for building a beachhouse called Arenaqua. So i can give a realistic view and educated guess what would happen IF we would put a seastead in that zone. Frankly there might be a thousand spots like that in the caribbean that have not been scouted yet and therefore not entered in the TSI universe as an option. What concerns the rest of your post above - exactly this is the way as i would start it. What we would build first is just a floating platform which will allow a small pioneering team to stay and de facto live in the zone. From this platform we would build more platforms for sales purpose or to expand the project - depends what turns out to be more feasible. I already mentioned that if i had a dozend of such platforms for sale right now i could sell them all in a 2 hour tow area. If i had a mero guasa breeding facility i could sell tons of product in the hotel sector. If i had a floating tourist attraction of any kind (scuba - underwater windows - shark feeding - beerstead) it would work just fine and economic feasible - right now the main trourism magnet is the oceanarium. I would suggest that before we even think in take a spot in consideration or dismiss it we should have a local scout who digs up realistic facts. - people who know the local situation should speak out, propose, we should end up with a criteria list, then do a spot evaluation according to the criteria list and then try to narrow it down to a handfull of places where a pilot project would be worth starting. Once pilot projects are in place some will run into "unexpected difficulties" and some will prosper - the most promising spot should be choosen as result of the pilot projects and major funds should be asigned to develop the spot. So digging out authentic info about a big number of spots and listen to the locals that know that spots, might be the best we can do for now to move a seasteading project forward - in this case we have at least a realistic plan based on hard facts in the case that start up fund should pop up. I agree with ocean that budget frames also limit the locations ... for example i am not really on board for acting as local frontman for a seasteading project that has total monthly funds in the "below 5k" range...because i know that below 5k you can certainly not build anything that will impress anybody and act as a gamechanger with investment magnet quality. I can not see why accumulating old houseboats should lead us to anything else than a accumulation of old houseboats and a hippie community that will not impress anybody and attract no investment from anywhere. ... - that was a content rich post - could make a forum about every single point - so let me start with the global view and then go into details...the reason why i came up with Rincon (as option not as obligated point) was that i see chances to start a float out project that can benefit from industrial, touristic, aquaculture, without narrow it necessaryly down from the very beginning to just one option. As i said if we build just a floating concrete platform - industry in mammonal (shipyard zone ) will love it for use as tool platform for afloat ship repair - and place a couple of orders, the hotelery segment will inmediatly imagine a bar kiosc with palm roof on it and want one for the decamaron island project. 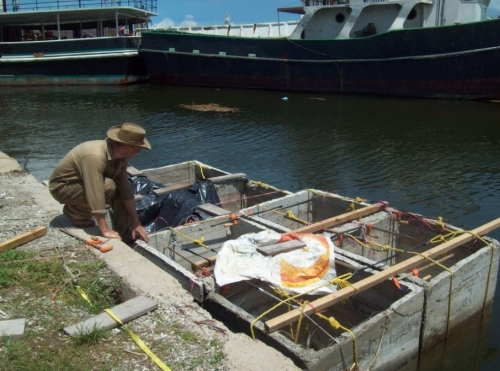 A floating mero guasa breeding project will see it as platform to expand aquaculture out of the fenced shallow zones. 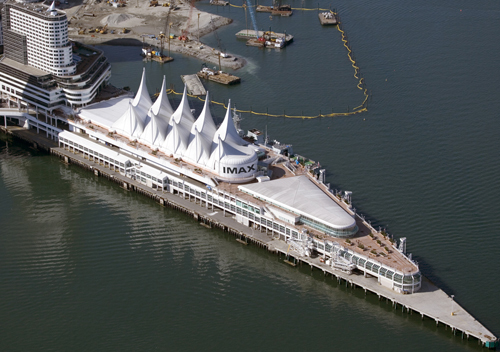 Marina developers will want it for floating marina boxes. So if we establish ourselfs as the "floating platform guys" we have business to do with a lot of different sectors all present in a 2 hour tow radius of the building site. The point is if we build something the very start up piece should make a compelling case for seasteading and a show piece how to do it and what we are talking about and why this is business relevant. A "goofy bottle island" or a "old houseboat accumulation" fail to create this effect - and we need this effect to step up and get support for later project phases. you can build your own beachhouse on it that blends into the zone - could look like this when done. You would basicly figure out how to build floating platforms modular, easy, economic, and start to use it for yourself - and sell them off as business in the zone to sustain yourself. I can organize concrete building in that zone at a global cost of USD 166/ton of displacement - tested that in pilot projects. Catamaran, plate, modular honeycomb - all fits into that global picture - concrete building per ton of floating structure - shape is secondary matter - what is important is having something afloat that lasts 200 years of service life - so has real estate quality and show feasibility quality. With a 5k/month funding level we can build 30 tons floating structure per month in a 2 worker setup. This means you can build something that makes people talk and invest in your project within a couple of months. the relative remoteness is not a drawback i see it as a benefit as it gives you high score on the interference freedom scale. 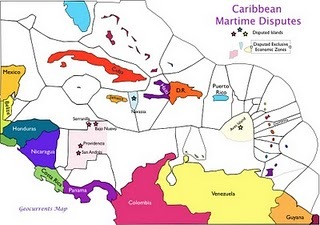 So without entering in a spot versus discussion i would insist in remote caribbean sites as first joice - i would also insist in avoid tourism hot spots, industrial hot spots, so my ideal zone would be quite remote but near ( 1- 2 hours in boat) to as well tourism hot zones and industrial hot zones to keep opportunities in both fields open. In no way i would rule out houseboats - i just would say that a houseboat accumulation of of the shelf housboats - and nothing else - due to budget shortfall - is proving nothing so not really worth doing it. Houseboat is fine to live in while building something that attracts investors because it goes beyond houseboats. One of the most important factors to avoid interference is to blend into a zone - if you check the material i put here to give a realistic impression of the rincon zone - you will understand that of the shelf houseboats do not blend in very well. It would be smarter to have platforms put traditional palmroof huts on them and live just as natives and tourist live in the zone already. If you blend in the chances that you get interference are minimum. Nobody will make a case against you because you replace traditional landfill and stilts (which have a eco impact) with much smarter and environment friendly floating bases. A tipical settlement in the zone right now looks like that: - a concrete floating platform with a palm hut on it will just look NO DIFFERENT but avoid eco destroying landfills in coral areas. The people who built this are infringing atl least 3 laws - you can not build in a zone of 30 m of the waterline , you can not make any changes to the litoral (landfill) you can not cut a single mangrove bush. The fact that those buildings are still there shows how bendable things are in colombia. Many people just think that this is nice after all - so it gets tolerated. If the houses would be ugly and full of a hippie community they would have got problems. I could sell platforms to the (wealthy owners) of such existing settlements as it would allow to still live in the zone and have a de facto house there without building a fixed fundament in the beach zone, cut no mangrove bush, so still stay inside the existing law. What you seek is the right mix of business opportuity, bendability, interference freedom, and tolerance culture, so that your project can prosper - a good advise is blend in do as the romans do - avoid to create a "strange appearance that triggers counter reactions". Be part of a desireable development instead of being part of a style breach. After we have a agreement about what general parameters MAKE a great seasteading start up spots, we should be able to SELECT great start up spots according to the agreed parameters. Before selecting we should have a discussion and opinion building process if Mariachi are really a important feature, or how necessary is an airport, and english language. Let's assume we have agreement on criteria and budget available with investors standing ready. (what we do not have non of these, but let's assume) - next phase would be PILOT PROJECT phase. It is of essence that we do NOT put all our eggs into just one basket. We would split the budget into lets say 10 equal parts and dedicate each part to one start up project to give it a try to come "real world" - then we would let the 10 projects develop and assume that 8 or 9 get shut down by some not predictable local factors, ( a intransigent coast guard official, a anti seasteading neighborhood initiative, etc...) in the first year. We would pack up the failed start ups and re- asign their budgets to the 1-2 project left standing after the first year. We would end up with 1-2 seasteading projects "in the saddle" after the pilot project year and have some first success to report in a "media package" to go and look for larger scale investment and take it to the next level. That is how big research driven companies do business - they always have dozends of pilot projects in their "pipelines" and they assume from the very beginning that due to circumstances of any kind only a few of those will make it in the end. And this brings us back to Blueseed if TSI is touting big media on a single project that can fail in the very start up phase very easyly due to any kind of factors, a failure of Blueseed will be seen as a failure of the Seasteading Movement - so my advice : do not put all your eggs into one basket. It is a case that was taken to supreme court over a floating home in florida that was destroyed because of standing in the way of other interests. This case showcases the need for mobility for a seastead and the need to select start up biotops where nothing else exists on the beachfront to get a high score on the interference freedom scale of 1-10. So the more practical approach is to look for a good and conflict free "de facto" situation and avoid "legal entaglement" completly. It also makes clear that the third party interference question is the most important cost and project factor in any float out project - there are huge differences in interference scale from bay to bay kilometer to kilometer interest zone to interest zone. Before floating anything out pilot projects on small scale to test out the interference situation on every single site are of utmost essence. Putting all your eggs into one basket - and then be obligated to bring it to supreme court is a lousy project strategy. Mobile concepts like the Ramform Seastead and the Captain Nemo float out have the additional "de facto security" of can move out of shark infested coastal waters...the lozman floating home did not.
. It is a floating housing space built at housing costs with housing materials glass doors, windows like you would use in a normal house - so its cost per squaremeter is compareable to normal housing. It avoids the pitfalls of other housing projects in the San Bernardo Islands that have got fricction with the Authorities because they cut down mangroves to clear building lots, fill up coral areas to create building lots, or illegally build in the public 30m waterfront beach zone. It is certainly not a yacht and seaworthy for ocean crossing - but this does not matter as the San Bernardo Zone is naturally protected from high waves and hurricane free all the year round. Other than the Lozman home which was not mobile at all and doomed to destruction when standing in the way of real estate interests - the navegante Cholon could move a few kilometers away from such a dogfight hotspot and even make it to another country. Its drawback is that it is made of steel and the maintainnce shedule of a steel structure in caribbean marine ambient is tremendously expensive. For a wide (and seasikness free stable) structure like the Navegant Cholon going to drydock is particulary expensive as the beam makes it needing a BIG drydock that normally operates big ships at big budgets. So they run on big ship budget manintenance shedules and cost frames. Having built that on a maintenance free floating concrete base it would be just a perfect single family seastead in a ideal easy going tropic low cost setup. So if we would have a reasonable budget for doing it today we would install in the san bernardo island area and start with a small concrete honeycomb ramform shape of not more than 15x 7 m - with a deck struture similar to navegate cholon - a open light concept - suitable for a tropic easy going hurricane free environment. 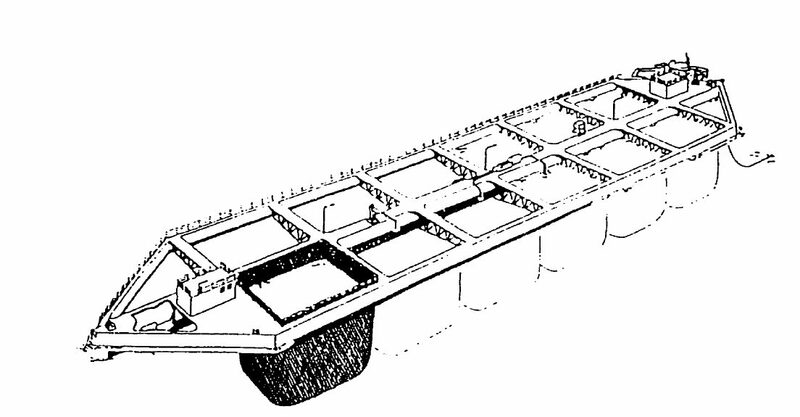 This structure would allow to live and work on the seastead itself - while keeping building it to larger size in the stern section as described in the ramform seastead thread. and end up to look something like this - a floating honeycomb structure - build modular and gradual - growing steadily to almost unlimited size - at the end it would look like a floating building. The superstructure of the ramform would have a design that would nicley blend into the zone - watched from a distance it would just look like a couple of bungalows built on stilts in shallow water. But it is still mobile, and could go to another place if third party interference start to become a problem. For comfort and business reasons this structure would stay in the calm mangrove and lagoon zones of the san bernardo islands - but it would have a structural soundness that exceeds by far what was performed in the Kon Tiki raft. And that kind of raft has been found to be capeable to do extensive oceanic voyages. Compare the seaworthyness of such a structure with KON TIKI and keep in mind that this raft made it over the pacific – you would get something technically at least equal. Just your “bambus hut” is a comfortable superstructure and your “balsa logs” are bigger and tougher and longer lasting as made of concrete. What we can learn from Kon Tiki is that it might be useful to maintain a certain flexibility between the floating elements, and that flat raft floats are much more seaworthy than generally expected. Kon Tiki a simple flat raft built on 8 balsa wood logs hold together with ropes sailed over the pacific - from Peru to Polinesia. Other than expected by naval engineers it did not break apart in the waves of the high seas. It is obvious that a concrete honeycomb structure would be still a lot more structural sound . It could start on a small scale in the hurricane free lagoon waters of the san bernardo islands and later float out to more unprotected caribbean waters.